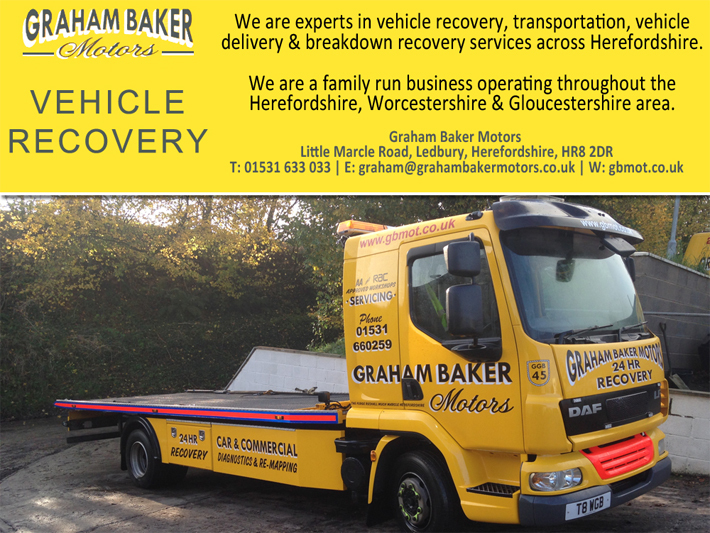 Graham Baker Motors offers vehicle recovery in Herefordshire offering a wide range of rescue and recovery services for motorcycles, cars, vans and other vehicles. Our team consists of fully qualified operators and mobile mechanics, many of them with 30-40 years of experience in the industry. We are equipped and ready to assist customers in any kind of undesirable circumstances. Graham Baker Motors provides a comprehensive, 24/7, rapid response service if your vehicle is immobile due to either an accident or breakdown. We are a family run business and pride ourselves on our commitment to provide a professional and speedy vehicle recovery service at all times, whilst maintaining the highest quality of work at very competitive rates. While recovering your car, motorcycle or van we will ensure that no further damage is caused and we treat you car with respect. Hereford, Leominster, Ledbury, Ross On Wye, Bromyard, Golden Valley, Hay On Wye, Weobley, Kington.